A credit card is a payment card issued to users (cardholders) to enable the cardholder to pay a merchant for goods and services based on the cardholder's promise to the card issuer to pay them for the amounts plus the other agreed charges. The card issuer (usually a bank) creates a revolving account and grants a line of credit to the cardholder, from which the cardholder can borrow money for payment to a merchant or as a cash advance. A credit card is different from a charge card, which requires the balance to be repaid in full each month. In contrast, credit cards allow the consumers to build a continuing balance of debt, subject to interest being charged. A credit card also differs from a cash card, which can be used like currency by the owner of the card. A credit card differs from a charge card also in that a credit card typically involves a third-party entity that pays the seller and is reimbursed by the buyer, whereas a charge card simply defers payment by the buyer until a later date. Credit cards have a printed  or embossed bank card number complying with the ISO/IEC 7812 numbering standard. The card number's prefix, called the Bank Identification Number, is the sequence of digits at the beginning of the number that determine the bank to which a credit card number belongs. This is the first six digits for MasterCard and Visa cards. The next nine digits are the individual account number, and the final digit is a validity check code. The concept of using a card for purchases was described in 1887 by Edward Bellamy in his utopian novel Looking Backward. Bellamy used the term credit card eleven times in this novel, although this referred to a card for spending a citizen's dividend from the government, rather than borrowing,  making it more similar to a Debit card. Until 1958, no one had been able to successfully establish a revolving credit financial system in which a card issued by a third-party bank was being generally accepted by a large number of merchants, as opposed to merchant-issued revolving cards accepted by only a few merchants. There had been a dozen attempts by small American banks, but none of them were able to last very long. In September 1958, Bank of America launched the BankAmericard in Fresno, California, which would become the first successful recognizably modern credit card. This card succeeded where others failed by breaking the chicken-and-egg cycle in which consumers did not want to use a card that few merchants would accept and merchants did not want to accept a card that few consumers used. Bank of America chose Fresno because 45% of its residents used the bank, and by sending a card to 60,000 Fresno residents at once, the bank was able to convince merchants to accept the card. It was eventually licensed to other banks around the United States and then around the world, and in 1976, all BankAmericard licensees united themselves under the common brand Visa. In 1966, the ancestor of MasterCard was born when a group of banks established Master Charge to compete with BankAmericard; it received a significant boost when Citibank merged its own Everything Card, launched in 1967, into Master Charge in 1969. Early credit cards in the U.S., of which BankAmericard was the most prominent example, were mass-produced and mass mailed unsolicited to bank customers who were thought to be good credit risks. They have been mailed off to unemployable people, drunks, narcotics addicts and to compulsive debtors, a process President Johnson's Special Assistant Betty Furness found very like "giving sugar to diabetics". These mass mailings were known as "drops" in banking terminology, and were outlawed in 1970 due to the financial chaos they caused. However, by the time the law came into effect, approximately 100 million credit cards had been dropped into the U.S. population. After 1970, only credit card applications could be sent unsolicited in mass mailings. Before the computerization of credit card systems in America, using a credit card to pay at a merchant was significantly more complicated than it is today. Each time a consumer wanted to use a credit card, the merchant would have to call their bank, who in turn had to call the credit card company, which then had to have an employee manually look up the customer's name and credit balance. This system was computerized in 1973 under the leadership of Dee Hock, the first CEO of Visa, allowing transaction time to decrease substantially to less than one minute. However, until always-connected payment terminals became ubiquitous at the beginning of the 21st century, it was common for a merchant to accept a charge, especially below a threshold value or from a known and trusted customer, without verifying it by phone. Books with lists of stolen card numbers were distributed to merchants who were supposed in any case to check cards against the list before accepting them, as well as verifying the signature on the charge slip against that on the card. Merchants who failed to take the time to follow the proper verification procedures were liable for fraudulent charges, but because of the cumbersome nature of the procedures, merchants would often simply skip some or all of them and assume the risk for smaller transactions. Although credit cards reached very high adoption levels in the US, Canada and the UK during the latter 20th century, many cultures were more cash-oriented or developed alternative forms of cashless payments, such as Carte bleue or the Eurocard (Germany, France, Switzerland, and others). In these places, adoption of credit cards was initially much slower. Due to strict regulations regarding bank overdrafts, some countries, France in particular, were much quicker to develop and adopt chip-based credit cards which are seen as major anti-fraud credit devices. Debit cards and online banking (using either ATMs or PCs[ clarification needed]) are used more widely than credit cards in some countries. It took until the 1990s to reach anything like the percentage market penetration levels achieved in the US, Canada, and UK. In some countries, acceptance still remains low as the use of a credit card system depends on the banking system of each country; while in others, a country sometimes had to develop its own credit card network, e.g. UK's Barclaycard and Australia's Bankcard. Japan remains a very cash-oriented society, with credit card adoption being limited mainly to the largest of merchants; although stored value cards (such as telephone cards) are used as alternative currencies, the trend is toward RFID-based systems inside cards, cellphones, and other objects. The design of the credit card itself has become a major selling point in recent years. The value of the card to the issuer is often related to the customer's usage of the card, or to the customer's financial worth. This has led to the rise of Co-Brand and Affinity cards, where the card design is related to the "affinity" (a university or professional society, for example) leading to higher card usage. In most cases a percentage of the value of the card is returned to the affinity group. Each month, the cardholder is sent a statement indicating the purchases made with the card, any outstanding fees, and the total amount owed. In the US, after receiving the statement, the cardholder may dispute any charges that he or she thinks are incorrect (see 15 U.S.C. § 1643, which limits cardholder liability for unauthorized use of a credit card to $50). The Fair Credit Billing Act gives details of the U.S. regulations. The cardholder must pay a defined minimum portion of the amount owed by a due date, or may choose to pay a higher amount. The credit issuer charges interest on the unpaid balance if the billed amount is not paid in full (typically at a much higher rate than most other forms of debt). In addition, if the cardholder fails to make at least the minimum payment by the due date, the issuer may impose a late fee or other penalties. To help mitigate this, some financial institutions can arrange for automatic payments to be deducted from the cardholder's bank account, thus avoiding such penalties altogether, as long as the cardholder has sufficient funds. Credit card advertising regulations in the U.S. include the Schumer box disclosure requirements. A large fraction of junk mail consists of credit card offers created from lists provided by the major credit reporting agencies. In the United States, the three major U.S. credit bureaus ( Equifax, TransUnion and Experian) allow consumers to opt out from related credit card solicitation offers via its Opt Out Pre Screen program. Independent sales organization: Re-sellers (to merchants) of the services of the acquiring bank. Business credit cards offer a number of features specific to businesses. They frequently offer special rewards in areas such as shipping, office supplies, travel, and business technology. Most issuers use the applicant's personal credit score when evaluating these applications. In addition, income from a variety of sources may be used to qualify, which means these cards may be available to businesses that are newly established. In addition, most major issuers of these cards do not report account activity to the owner's personal credit unless there is a default. 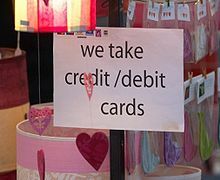 [ citation needed] This may have the effect of protecting the owner's personal credit from the activity of the business. A "prepaid credit card" is not a true credit card,  since no credit is offered by the card issuer: the cardholder spends money which has been "stored" via a prior deposit by the cardholder or someone else, such as a parent or employer. However, it carries a credit-card brand (such as Discover, Visa, MasterCard, American Express, or JCB) and can be used in similar ways just as though it were a credit card. Unlike debit cards, prepaid credit cards generally do not require a PIN. An exception are prepaid credit cards with an EMV chip. 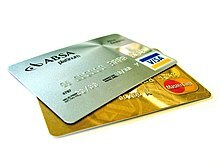 These cards do require a PIN if the payment is processed via Chip and PIN technology. Prior to credit cards, each merchant had to evaluate each customer's credit history before extending credit. That task is now performed by the banks which assume the credit risk. Credit cards can also aid in securing a sale especially if the customer does not have enough cash on hand or in a checking account. Extra turnover is generated by the fact that the customer can purchase goods and services immediately and is less inhibited by the amount of cash in pocket and the immediate state of the customer's bank balance. Much of merchants' marketing is based on this immediacy. Credit card security relies on the physical security of the plastic card as well as the privacy of the credit card number. Therefore, whenever a person other than the card owner has access to the card or its number, security is potentially compromised. Once, merchants would often accept credit card numbers without additional verification for mail order purchases. It's now common practice to only ship to confirmed addresses as a security measure to minimise fraudulent purchases. Some merchants will accept a credit card number for in-store purchases, whereupon access to the number allows easy fraud, but many require the card itself to be present, and require a signature (for magnetic stripe cards). A lost or stolen card can be cancelled, and if this is done quickly, will greatly limit the fraud that can take place in this way. European banks can require a cardholder's security PIN be entered for in-person purchases with the card. The goal of the credit card companies is not to eliminate fraud, but to "reduce it to manageable levels". This implies that fraud prevention measures will be used only if their cost are lower than the potential gains from fraud reduction, whereas high-cost low-return measures will not be used – as would be expected from organizations whose goal is profit maximization. Internet fraud may be by claiming a chargeback which is not justified (" friendly fraud"), or carried out by the use of credit card information which can be stolen in many ways, the simplest being copying information from retailers, either online or offline. Despite efforts to improve security for remote purchases using credit cards, security breaches are usually the result of poor practice by merchants. For example, a website that safely uses TLS to encrypt card data from a client may then email the data, unencrypted, from the webserver to the merchant; or the merchant may store unencrypted details in a way that allows them to be accessed over the Internet or by a rogue employee; unencrypted card details are always a security risk. Even encrypted data may be cracked. Additionally, there are security features present on the physical card itself in order to prevent counterfeiting. For example, most modern credit cards have a watermark that will fluoresce under ultraviolet light. [ citation needed] Most major credit cards have a hologram. A Visa card has a letter V superimposed over the regular Visa logo and a MasterCard has the letters MC across the front of the card. Older Visa cards have a bald eagle or dove across the front. In the aforementioned cases, the security features are only visible under ultraviolet light and are invisible in normal light. The United States Secret Service, Federal Bureau of Investigation, U.S. Immigration and Customs Enforcement, and U.S. Postal Inspection Service are responsible for prosecuting criminals who engage in credit card fraud in the United States. [ citation needed] However, they do not have the resources to pursue all criminals, and in general they only prosecute cases exceeding $5,000. A charge-off is considered to be "written off as uncollectible". To banks, bad debts and fraud are part of the cost of doing business. In relative numbers the values lost in bank card fraud are minor, calculated in 2006 at 7 cents per 100 dollars worth of transactions (7 basis points). In 2004, in the UK, the cost of fraud was over £500 million. When a card is stolen, or an unauthorized duplicate made, most card issuers will refund some or all of the charges that the customer has received for things they did not buy. These refunds will, in some cases, be at the expense of the merchant, especially in mail order cases where the merchant cannot claim sight of the card. In several countries, merchants will lose the money if no ID card was asked for, therefore merchants usually require ID card in these countries. Credit card companies generally guarantee the merchant will be paid on legitimate transactions regardless of whether the consumer pays their credit card bill. Most banking services have their own credit card services that handle fraud cases and monitor for any possible attempt at fraud. Employees that are specialized in doing fraud monitoring and investigation are often placed in Risk Management, Fraud and Authorization, or Cards and Unsecured Business. Fraud monitoring emphasizes minimizing fraud losses while making an attempt to track down those responsible and contain the situation. Credit card fraud is a major white collar crime that has been around for many decades, even with the advent of the chip based card (EMV) that was put into practice in some countries to prevent cases such as these. Even with the implementation of such measures, credit card fraud continues to be a problem. These fees are typically from 1 to 6 percent of each sale, but will vary not only from merchant to merchant (large merchants can negotiate lower rates ), but also from card to card, with business cards and rewards cards generally costing the merchants more to process. The interchange fee that applies to a particular transaction is also affected by many other variables including: the type of merchant, the merchant's total card sales volume, the merchant's average transaction amount, whether the cards were physically present, how the information required for the transaction was received, the specific type of card, when the transaction was settled, and the authorized and settled transaction amounts. In some cases, merchants add a surcharge to the credit cards to cover the interchange fee, encouraging their customers to instead use cash, debit cards, or even cheques. Many credit card customers receive rewards, such as frequent flyer points, gift certificates, or cash back as an incentive to use the card. Rewards are generally tied to purchasing an item or service on the card, which may or may not include balance transfers, cash advances, or other special uses. Depending on the type of card, rewards will generally cost the issuer between 0.25% and 2.0% of the spread. Networks such as Visa or MasterCard have increased their fees to allow issuers to fund their rewards system. Some issuers discourage redemption by forcing the cardholder to call customer service for rewards. On their servicing website, redeeming awards is usually a feature that is very well hidden by the issuers. [ citation needed] With a fractured and competitive environment, rewards points cut dramatically into an issuer's bottom line, and rewards points and related incentives must be carefully managed to ensure a profitable portfolio. [ citation needed] Unlike unused gift cards, in whose case the breakage in certain US states goes to the state's treasury, unredeemed credit card points are retained by the issuer. One controversial area is the trailing interest issue. Trailing interest is the practice of charging interest on the entire bill no matter what percentage of it is paid. U.S. Senator Carl Levin raised the issue of millions of Americans affected by hidden fees, compounding interest and cryptic terms. Their woes were heard in a Senate Permanent Subcommittee on Investigations hearing which was chaired by Senator Levin, who said that he intends to keep the spotlight on credit card companies and that legislative action may be necessary to purge the industry. In 2009, the C.A.R.D. Act was signed into law, enacting protections for many of the issues Levin had raised. The Credit CARD Act of 2009 requires that consumers opt into over-limit charges. Some card issuers have therefore commenced solicitations requesting customers to opt into over-limit fees, presenting this as a benefit as it may avoid the possibility of a future transaction being declined. Other issuers have simply discontinued the practice of charging over-limit fees. Whether a customer opts into the over-limit fee or not, banks will in practice have discretion as to whether they choose to authorize transactions above the credit limit or not. Of course, any approved over limit transactions will only result in an over-limit fee for those customers who have opted into the fee. This legislation took effect on 22 February 2010. Following this Act, the companies are now required by law to show on a customer's bills how long it would take them to pay off the balance. The database also feeds into an interactive tool on the FCAC website. The interactive tool uses several interview-type questions to build a profile of the user's credit card usage habits and needs, eliminating unsuitable choices based on the profile, so that the user is presented with a small number of credit cards and the ability to carry out detailed comparisons of features, reward programs, interest rates, etc. Many credit cards can also be used in an ATM to withdraw money against the credit limit extended to the card, but many card issuers charge interest on cash advances before they do so on purchases. The interest on cash advances is commonly charged from the date the withdrawal is made, rather than the monthly billing date. Many card issuers levy a commission for cash withdrawals, even if the ATM belongs to the same bank as the card issuer. Merchants do not offer cashback on credit card transactions because they would pay a percentage commission of the additional cash amount to their bank or merchant services provider, thereby making it uneconomical. Discover is a notable exception to the above. A customer with a Discover card may get up to $120 cash back if the merchant allows it. This amount is simply added to the card holder's cost of the transaction and no extra fees are charged as the transaction is not considered a cash advance. Credit cards are a risky way for entrepreneurs to acquire capital for their start ups when more conventional financing is unavailable. Len Bosack and Sandy Lerner used personal credit cards  to start Cisco Systems. Larry Page and Sergey Brin's start up of Google was financed by credit cards to buy the necessary computers and office equipment, more specifically "a terabyte of hard disks". Similarly, filmmaker Robert Townsend financed part of Hollywood Shuffle using credit cards. Director Kevin Smith funded Clerks in part by maxing out several credit cards. Actor Richard Hatch also financed his production of Battlestar Galactica: The Second Coming partly through his credit cards. Famed hedge fund manager Bruce Kovner began his career (and, later on, his firm Caxton Associates) in financial markets by borrowing from his credit card. UK entrepreneur James Caan (as seen on Dragons' Den) financed his first business using several credit cards. ^ O'Sullivan, Arthur; Steven M. Sheffrin (2003). Economics: Principles in action (Textbook). Upper Saddle River, New Jersey 07458: Pearson Prentice Hall. p. 261. ISBN 0-13-063085-3. ^ Schneider, Gary (2010). Electronic Commerce. Cambridge: Course Technology. p. 497. ISBN 0-538-46924-2. ^ "For Merchants - MasterCard Unembossed". MasterCard. ^ Dunaway, Jaime (18 April 2018). "Why Are Credit Card Numbers on the Back Now?". Slate. Retrieved 18 April 2018. ^ "Life before plastic: Historical look at credit card materials". creditcards.com. ^ Charles Boston. "Shopping Days In Retro Boston". shoppingdaysinretroboston.blogspot.com. ^ "The Department Store Museum: Charge Cards". departmentstoremuseum.blogspot.com. ^ "Credit card imprinter". Cultureandcommunication.org. Retrieved 28 July 2011. ^ "Hartford Charga-plate Associates, Incorporated, Plaintiff-appellant, v. Youth Centre-cinderella Stores, Inc., Defendant-respondent, 215 F.2d 668 (1954)". Retrieved 11 November 2014. The only approach to any of this was an original contention by plaintiff's manufacturer, the Farrington Manufacturing Company, that defendant was violating its registered trade-mark 'Charga-Plate.' But defendant thereafter instructed its clerks to use some other term, e.g., 'charge plate' or 'credit plate,' and no claim of trade-mark infringement is before us. ^ "The Travel Card that gave "CREDIT" to the public". Flying. Vol. 52 no. 6. June 1953. p. 11. Retrieved 11 November 2018. ^ "History Of The Credit Card". www.creditcardprocessingspace.com. Retrieved 14 February 2013. ^ a b Mayyasi, Alex. "How Credit Cards Tax America". Pricenomics. ^ O'Neill, Paul (27 April 1970). "A Little Gift from Your Friendly Banker". LIFE. ^ LaMagna, Maria. "Metal credit cards: The latest American status symbol". MarketWatch. Retrieved 7 March 2018. ^ "Report to the Congress on the Use of Credit Cards by Small Businesses and the Credit Card Market for Small Businesses" (PDF). Federal Reserve. Board of Governors of the Federal Reserve System. May 2010. Retrieved 4 May 2015. ^ "5 Business Credit Card Myths That Can Cost Your Business | AllBusiness.com". AllBusiness.com. 21 December 2016. Retrieved 10 April 2017. ^ a b c d "Credit Cards and You – About Pre-paid Cards". Financial Consumer Agency of Canada. Archived from the original on 7 March 2007. Retrieved 9 January 2008. document: "Pre-paid Cards" (PDF). Financial Consumer Agency of Canada. Archived from the original (PDF) on 29 February 2008. Retrieved 9 January 2008. ^ "FAQs". UK Cards Association. Retrieved 19 September 2012. ^ "Credit Card protection, assistance and savings". MasterCard. ^ "Retail, Entertainment and Travel Protection Benefit Guides". ^ "Exploring Credit Card Benefits". Discoverer. ^ "Return Protection | Personal | Visa USA". Retrieved 28 August 2013. ^ "What is Return Guarantee? | Discover". www.discover.com. Retrieved 17 January 2019. ^ "What is Extended Product Warranty? | Discover". www.discover.com. Retrieved 17 January 2019. ^ "What is Price Protection? | Discover". Retrieved 16 January 2019. ^ "Car Rental Loss Damage Insurance - American Express". Retrieved 28 August 2013. ^ CreditCards.com (27 January 2010). "Credit card penalty rates can top 30 percent; how to avoid them". Creditcards.com. Retrieved 26 March 2013. ^ Prater, Connie (7 April 2010). "Issuer of 79.9% interest rate credit card defends its product". FoxBusiness.com. Retrieved 28 July 2011. ^ Ellis, Blake (17 February 2011). "First Premier Bank removes credit card with 59.9% APR". CNN. Retrieved 1 October 2015. ^ Drazen Prelec & George Loewenstein (21 December 1998). "The Red and the Black: Mental Accounting of Savings and Debt". Mktsci.journal.informs.org. Archived from the original on 10 July 2012. Retrieved 26 March 2013. ^ "Finally, Money Advice That Will Make You Skinnier". Time. 7 July 2011. ^ a b Martin, Andrew (4 January 2010). "How Visa, Using Card Fees, Dominates a Market". The New York Times. Retrieved 6 January 2010. The fees, roughly 1 to 3 percent of each purchase, are forwarded to the cardholder’s bank to cover costs and promote the issuance of more Visa cards. ^ a b c Dickler, Jessica (31 July 2008). "Hidden credit card fees are costing you". CNN. Retrieved 30 April 2010. ^ Carr, Ted (2 September 2010). "Minimizing Confusion Over Minimums". Blog.visa.com. Archived from the original on 23 July 2011. Retrieved 28 July 2011. ^ Boston, Federal Reserve Bank of (9 November 2012). "Who Gains and Who Loses from Credit Card Payments? Theory and Calibrations". Federal Reserve Bank of Boston. ^ "Example of a supplement chargeable to the customer when paying by credit card". Bmibaby.com. 5 January 2011. Archived from the original on 8 July 2011. Retrieved 28 July 2011. ^ a b Douglas, Danielle. "Judge approves Visa, MasterCard $5.7 billion settlement with retailers". Washington Post. ^ "PCI Compliance". Thrive Business Solutions. Archived from the original on 5 March 2008. ^ "Secure POS Vendor Alliance is launched by Hypercom, Ingenico and VeriFone". ECommerce Journal. 2009. Archived from the original on 26 April 2009. ^ "Code 10". Visa Inc. Archived from the original on 15 November 2012. Retrieved 28 November 2012. ^ "MasterCard Card Identification Features". MasterCard. Retrieved 28 November 2012. ^ "CARD_ID_FEATURES_MERCHANT.PDF" (PDF). Discover Card. Retrieved 28 November 2012. ^ "American Express Fraud Prevention Handbook" (PDF). American Express. Retrieved 11 November 2014. ^ United States Securities and Exchange Commission FORM S-1, 9 November 2007. ^ Gracia, Mike (9 May 2008). "credit cards abroad". creditchoices.co.uk. Archived from the original on 12 June 2008. Retrieved 9 May 2008. ^ "Comparison of exchange rates using Visa and Diners Club cards in Bali". Lonelyplanet.com. 3 March 2010. Archived from the original on 11 July 2011. Retrieved 28 July 2011. ^ "Federal Reserve Board: Credit Card Rules". U.S. Federal Reserve Board. Archived from the original on 6 January 2014. Retrieved 27 January 2014. ^ Joseph S. Enoch. "Credit Card Executives Tough Out Senate Hearing". Consumeraffairs.com. Retrieved 28 July 2011. ^ "Statutory Instrument 1990 No. 2159: The Credit Cards (Price Discrimination) Order 1990". Opsi.gov.uk. Retrieved 28 July 2011. ^ American FactFinder, United States Census Bureau. "US Census: 2005–2007 American Community Survey 3-Year Estimates". Factfinder.census.gov. Archived from the original on 26 April 2011. Retrieved 28 July 2011. ^ "Experian's National Score Index". Nationalscoreindex.com. Retrieved 28 July 2011. ^ "Prime Numbers: The Plastic Revolution". Foreign Policy. 19 February 2008. Archived from the original on 15 January 2009. Retrieved 28 July 2011. ^ "This is Money Card charges to be slashed". Thisismoney.co.uk. 13 March 2006. Retrieved 28 July 2011. ^ "Current credit card default charges unfair". Oft.gov.uk. Archived from the original on 27 March 2010. Retrieved 28 July 2011. ^ "FCAC - Interactive Tools - Credit Card Selector Tool". FCAC. Archived from the original on 21 December 2013. ^ "A start-up's true tale". Pdp10.nocrew.org. Retrieved 28 July 2011. ^ Yu, Roger (2 June 2010). "Americans abroad run into trouble using credit cards". USA Today.